What's she like to fly? 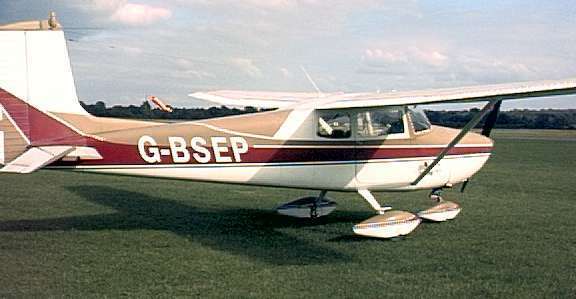 Echo-Papa is a 1959 Cessna 172. She's the same type of aircraft that I learnt to fly in, except that being an early model she has a few slight differences. From my point of view, the most important difference is the fact that I own a 1/6th share in her, which makes it massively cheaper (per hour) to fly Echo-Papa rather than Cabair's aircraft. 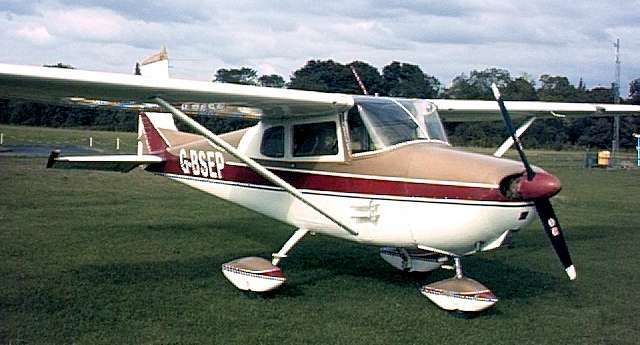 Echo-Papa is, I believe, the oldest Cessna 172 in the country - certainly the oldest on the UK register (there could conceivably be other 172's on the US "N" register living in this country, for example). She appears to be the only original model "C172" - as distinct from the "C172A" which was brought out a year or two after Echo-Papa was built. If you can prove me wrong by finding another aircraft in the G-INFO online aircraft register then please let me know! 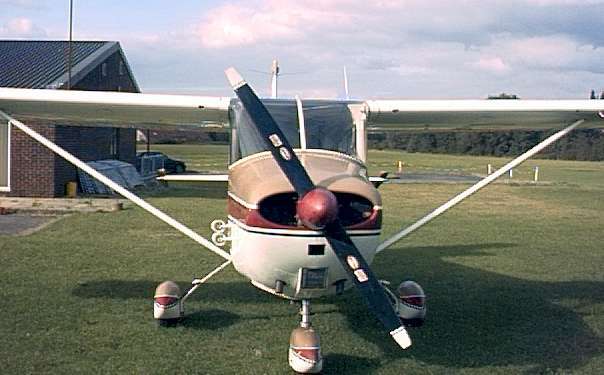 The picture above, and the picture of one of Cabair's C172's to the right, illustrate some of the differences in body shape. Perhaps the most obvious is the fact that she has an upright tailfin rather than the swept-back tail, which I think was introduced with the "C172A" model. If I'm right, then this means Echo-Papa is the only 172 in this country who has the original upright tailfin. The picture above illustrates another difference between Echo-Papa and the newer C172's. Attached to the right-hand side of the fuselage just forward of the door are two venturi tubes (these can be seen on the left in the picture, just below the red stripe). Most light aircraft have some instruments that are driven by vacuum - the gyros in the direction indicator and the attitude indicator being the most common. In newer aircraft, this vaccuum is usually generated by an engine-driven vacuum pump, but instead Echo-Papa has these venturis. The disadvantages are that the tubes create a certain amount of drag, and you don't get quite enough vacuum when you're taxying on the ground because of the insufficient air-speed - but apart from this the system seems perfectly reliable and works well. The picture above illustrates the layout of the instrument panel. You can hover your mouse over parts of the picture to find out what everything is. The primary instruments are not in the standard "T" configuration normally used today, so this would make for an "interesting" instrument scan - not that Echo-Papa is really suitable for flying on instruments anyway. Internally, Echo-Papa is fairly similar to the newer C172's. The most obvious difference is the rather "retro" styling of the control yokes - to me they're reminiscent of the steering wheels on American cars of the 1950's. The other main difference is the fact that the flaps are of the "manual" type, rather than being electrically driven. 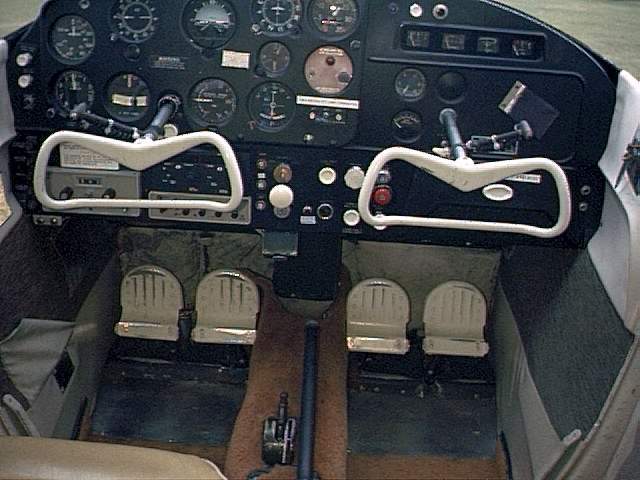 This means that Echo-Papa has a large lever on the floor between the two front seats that looks like an oversized handbrake lever - this is what operates the flaps via a system of cables and pulleys, whereas the newer C172's have a discreet lever on the instrument panel that operates an electric motor to drive the flaps. Echo-Papa's flaps have four settings, at 10 degrees, 20, 30 and 40 degrees. The 40 degree position was withdrawn on later model C172's, which is a shame because they allow you to achieve a very steep descent if you need it. Under the cowling, Echo-Papa has a different engine from the newer C172's. All the newer ones from about the late sixties onwards have a 4-cylinder Lycoming O-320 engine (which came in various flavours, some more successful than others), whereas Echo-Papa has the older 6-cylinder Continental O-300 engine. Despite the two extra cylinders, this engine is actually slightly smaller in capacity and produces slightly less power (145 hp instead of 160 hp). But the great thing about the Continental is the noise it makes - a much "meatier" sound! 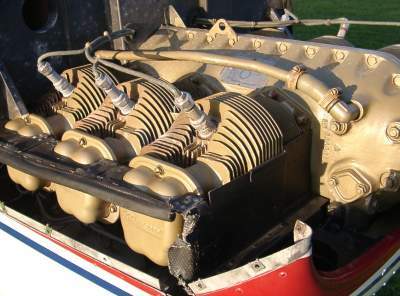 Both the Lycoming and Continental engines are typical of the huge majority of piston engines fitted to light aircraft. They have the cylinders arranged in a flat, horizontally-opposed configuration, and they are air-cooled. 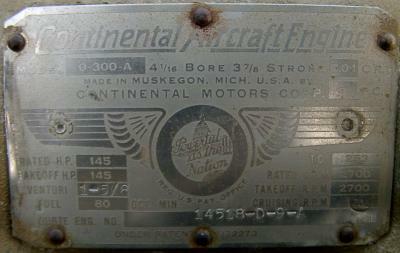 Left: The engine plate on G-BSEP's engine. Provided you're not in a hurry, that is. The older C172's are not as fast as the newer ones, and so far I've found that when throttled back to about 2250 rpm, Echo-Papa cruises at about 95 mph (that's probably about 85 knots - in common with many older aircraft, her airspeed indicator is calibrated in mph, although it does have an inner scale that reads knots). Echo-Papa certainly would go faster, but now that she's partly my aircraft the strong urge is to throttle back a bit further and just enjoy the scenery! Echo-Papa's instrumentation and avionics include an ADF, one VOR (but no DME) and a transponder (although I haven't yet been able to verify whether the altitude encoding works) [*]. She's also the only aircraft I have so far flown that actually has a working EGT gauge, which takes some of the guesswork out of leaning the fuel mixture. [*] Stop press: On the way over to Rochester for the Flyer Forum fly-out to Le Touquet on Saturday 5th October, I gave Thames Radar a quick call to ask them to confirm whether mode Charlie works on Echo-Papa's transponder. The controller gave me a squawk, and then seemed to forget about me as he dealt with a few helicopters over London. After I gave him a tactful reminder a few minutes later, he told me to squawk "ident" and report my level, and then said "Yep, that's all working fine!". Having mode Charlie (where your transponder displays your altitude on all radar operator's screens) is a big boost to safety, and also means that you're more likely to be given clearances to enter controlled airspace because they can see that you're complying with their level instructions.